Tuesday, November 4, 2014. If you haven’t already cast your vote in this year’s general election, I encourage you to go today. Today is Election Day. Use the nifty tool above to find your polling location. This nifty tool is provided courtesy of the fine folks at WordPress. 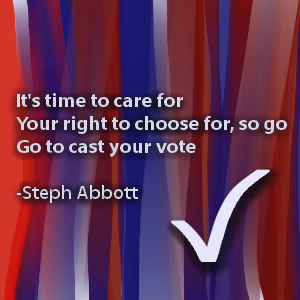 For my part of this post, I simply created the meme, “Go Cast Your Vote” using Art Rage 4 software to go with the haiku I wrote. I never fail to vote.